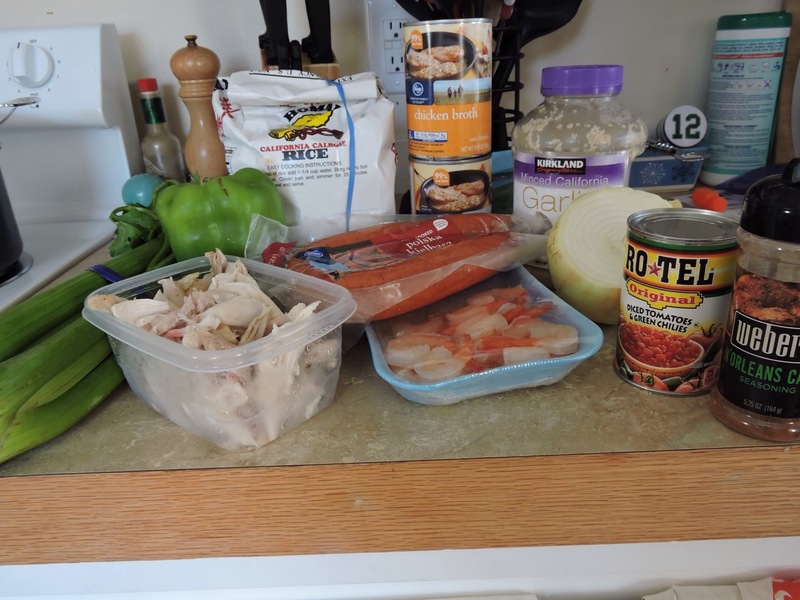 I have been wanting to do something different from our daily routine for dinner, and I’ve been craving spicy and shrimp. 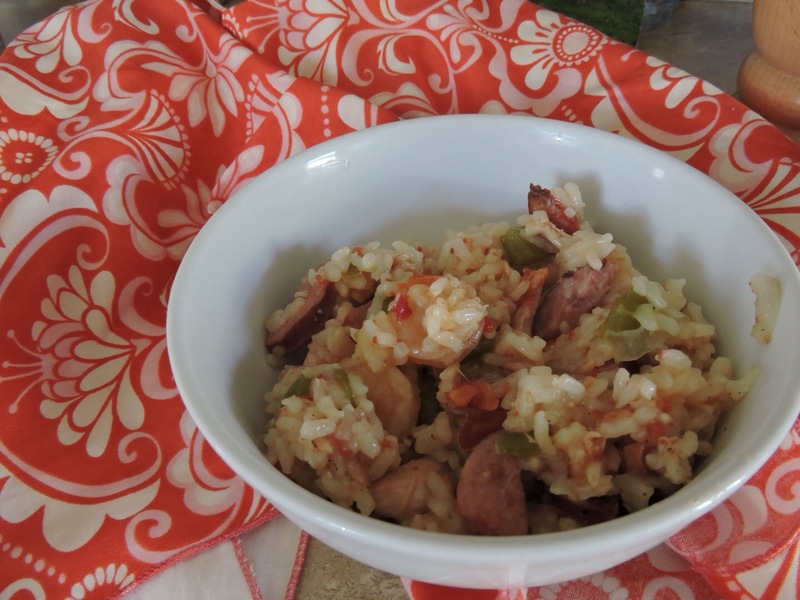 So what better than jambalaya! 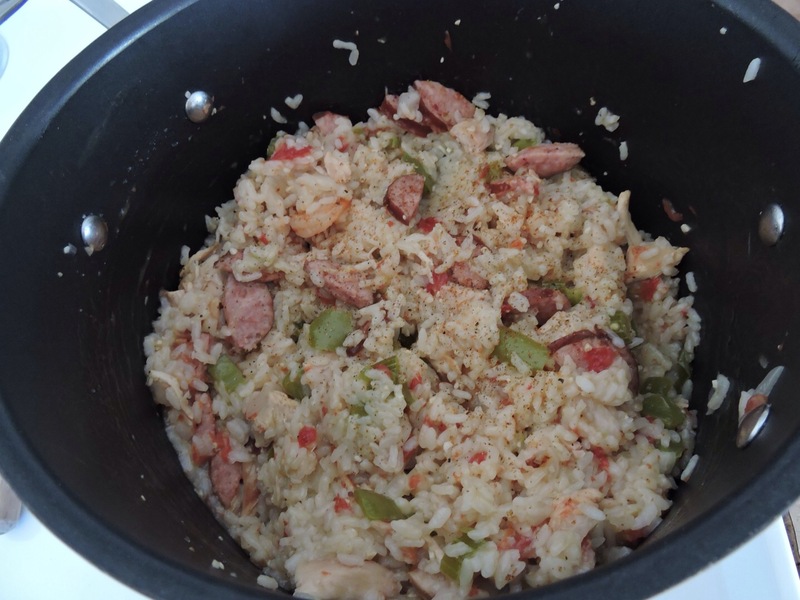 I couldn’t find one perfect easy recipe, so I just took bits and pieces from several with a few additions of my own – the results are fantastic! Or as my family calls it; Jambi. 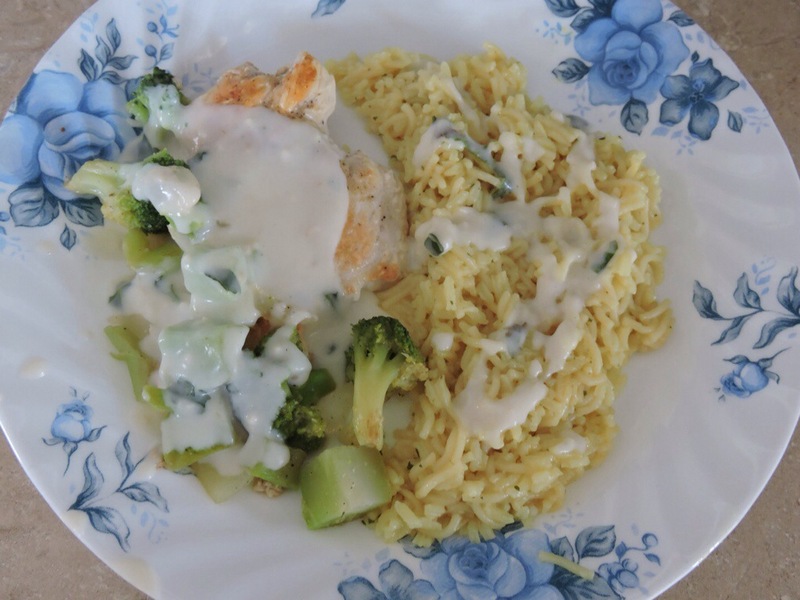 In this recipe you could absolutely use 1-2 uncooked, cut chicken breasts and just cook them first. 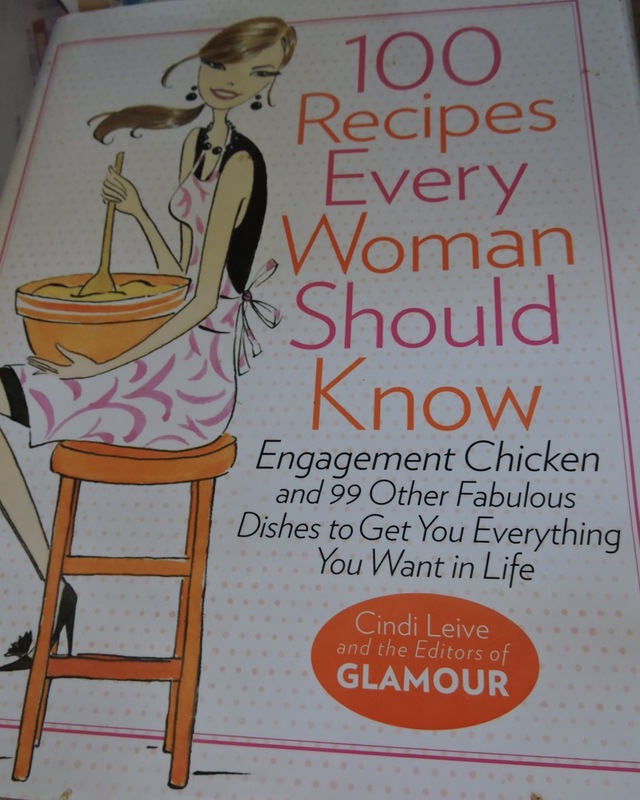 I, however, had left overs from this week making Engagement Chicken from one of my favorite cookbooks! Truly, give this one a go – both the book and the recipe. Easy, DELICIOUS chicken proven time and time again to impress your guests – or your significant other, or yourself… Whoever. Heat oil in a large pot over medium heat. 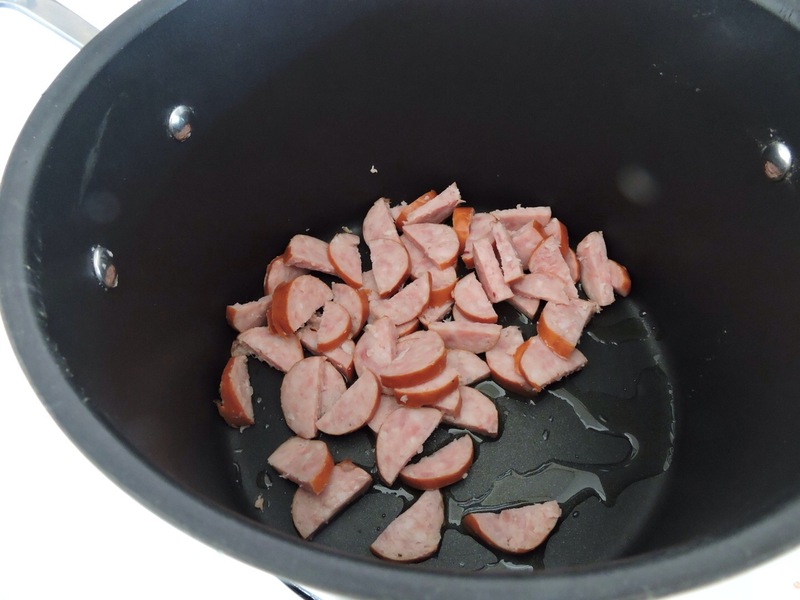 Sauté kielbasa until it begins to brown. Add chicken and sauté a few minutes more until meat is browned. 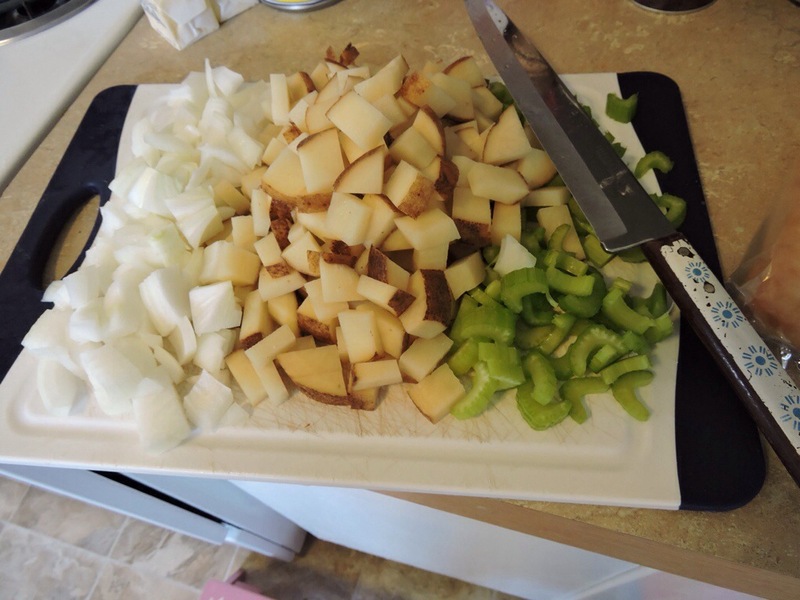 Add peppers and onions, sauté 2 minutes until they begin to soften. 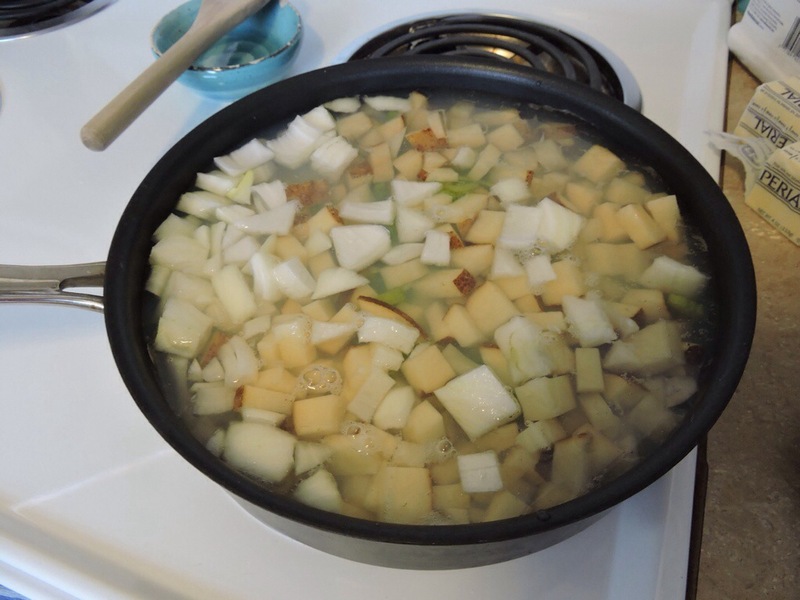 Add celery and garlic, sauté a few minutes more until onions begin to become translucent. Add and stir in seasonings to taste. 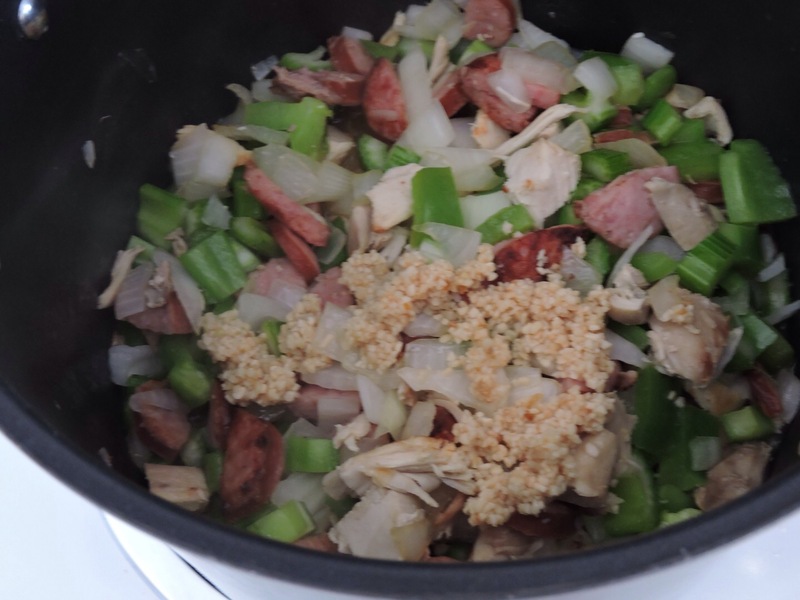 I recommend at least 1-2 teaspoons of Cajun seasoning, but err on the side of caution since you can always add later. Add my own little secret ingredient, the entire Rotel can, juices and all. 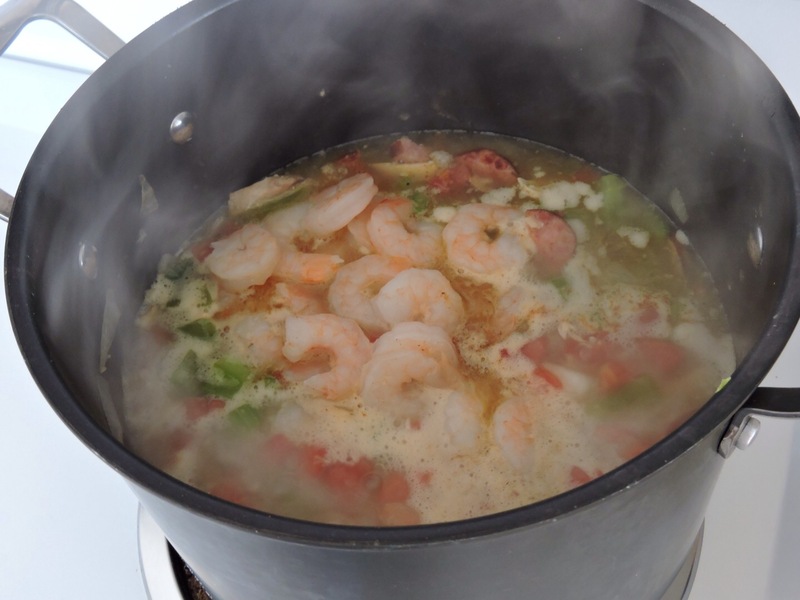 Add shrimp to the top of the mixture. Reduce heat to medium low and cover. 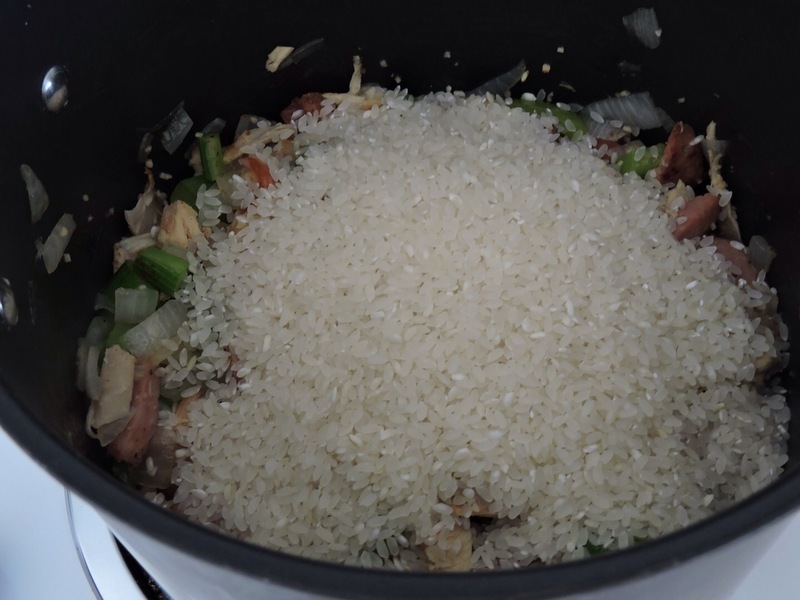 Cook 20-30 minutes, or until rice is tender. Remove from heat and stir in Worcestershire and hot sauce. Leave the lid on to keep the moisture in, but now is the perfect time to taste and add more seasonings as needed. So my daughter and I had a lazy day today. So lazy that I looked at the clock in enough time to realize that I only had two hours before I had to leave for work to cook, clean, and shower. I still decided to put some effort into dinner with what little we had in our cupboards and got creative. The results were fantastic. Oil frying pan, season chicken breasts, and pan fry on medium heat. Brown both sides of chicken, reducing heat if needed to time dinner preperations. 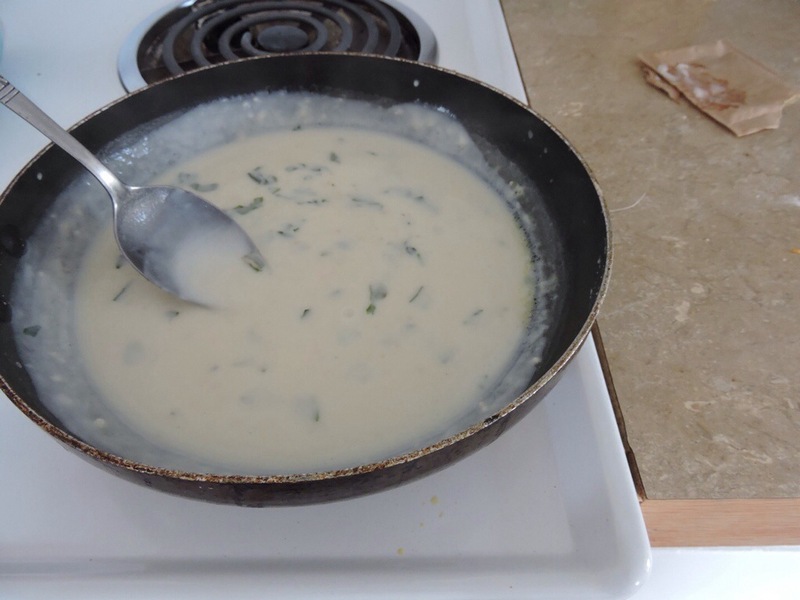 In a separate pan, melt butter for sauce in low heat. Once melted add garlic. Stir occasionally, smearing garlic with the bottom of your spoon to reduce the garlic into the butter, about 3-5 minutes. Add flour and salt. 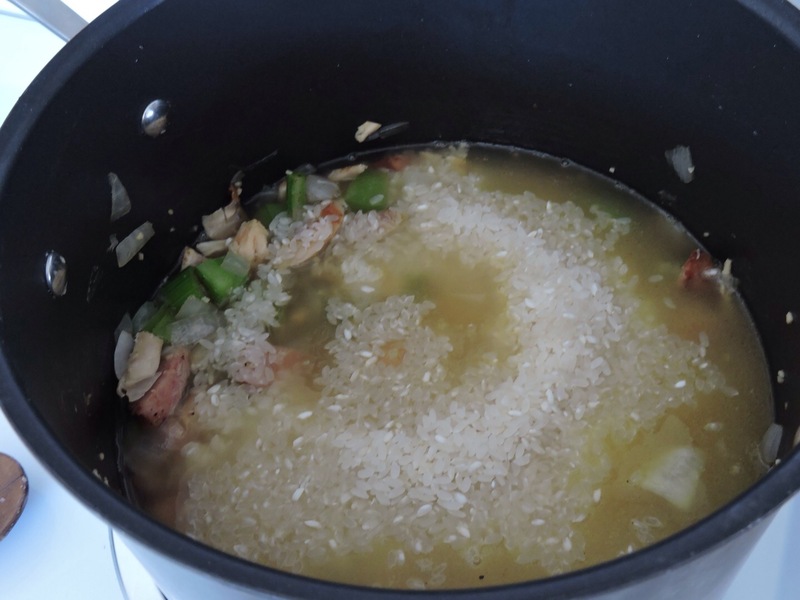 Stir/spread mixture frequently for approximately 3 minutes to minimize flour taste and texture. 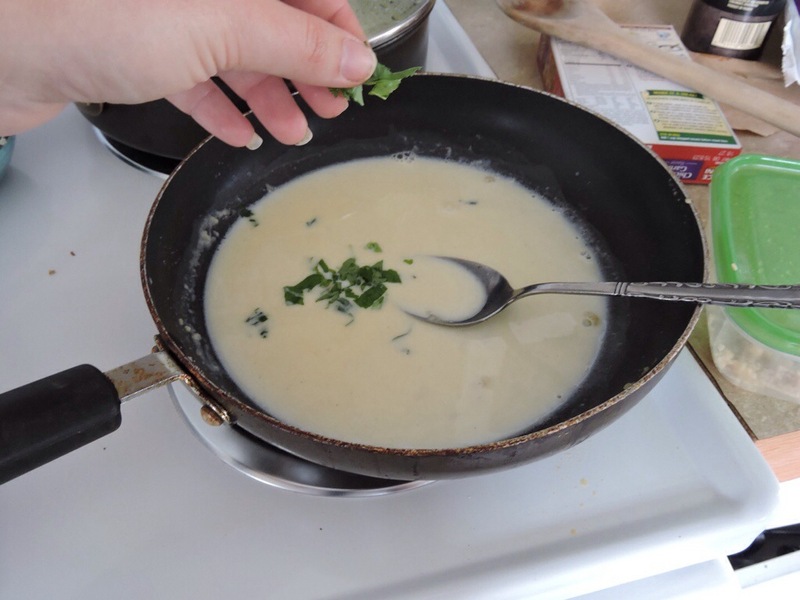 Slowly and simultaneously add milk and chopped basil until completely combined. Raise heat to medium low and stir occasionally. 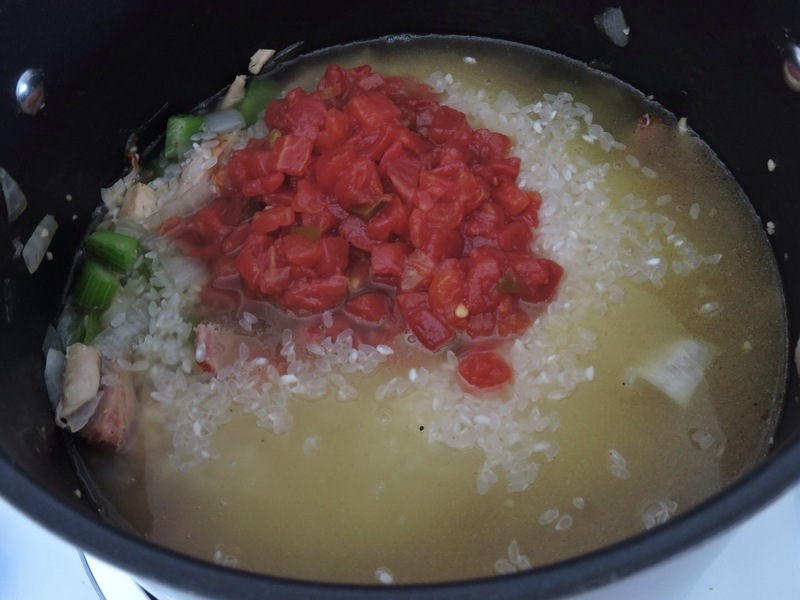 Turn off heat when sauce has reached desired thickness. 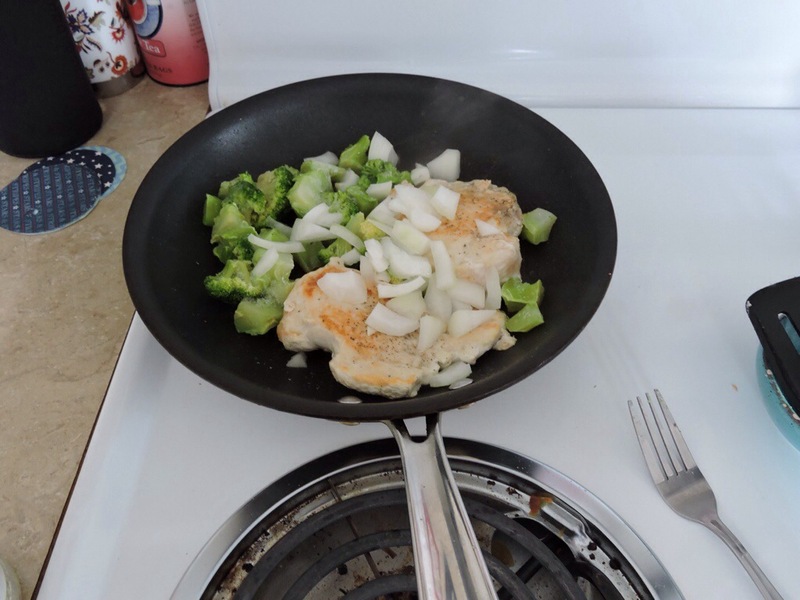 In the meantime, after both sides of chicken are browned, add broccoli and onion to fry pan. Add extra seasonings if needed. 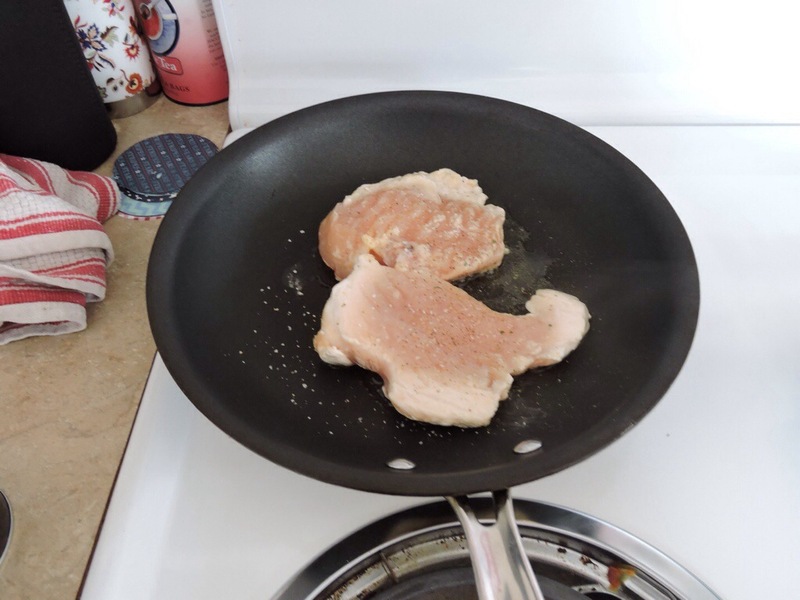 Sauté with chicken until tender. 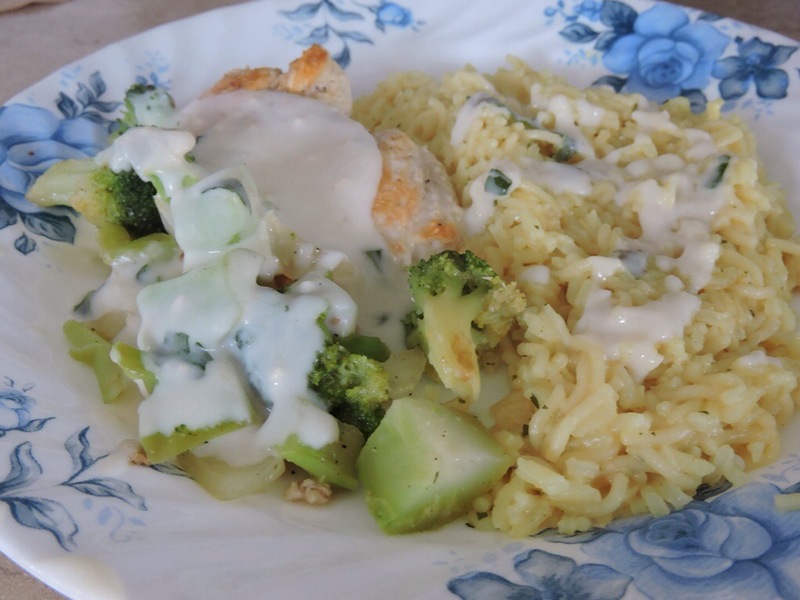 Plate with rice of choice, covering both rice and chicken/vegetable fry with cream sauce. So delicious! A great thing I love about living in Washington State is having the beach, the city, and country life all within a thirty minute drive. I have family in all of these areas, and I myself live in the city, only a hop-skip from the beach. My grandparents, however, live a little more in the country. They have horses and small stables, and their property has a creek dividing their home from their orchard. They have apple trees, plum trees, grapes, walnuts, blueberries and more. 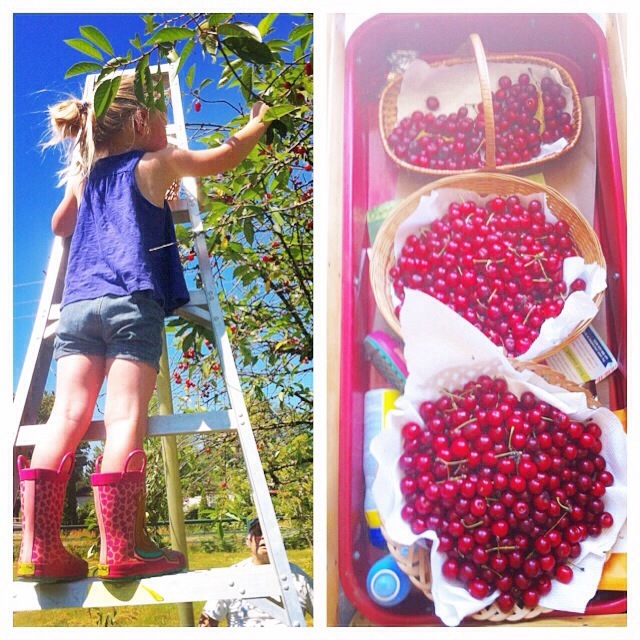 Most recently they had an overwhelming amount of ripe pie cherries. My daughter and I were happy to oblige. Those baskets are deeper than they look. To start, preheat your oven to 350. 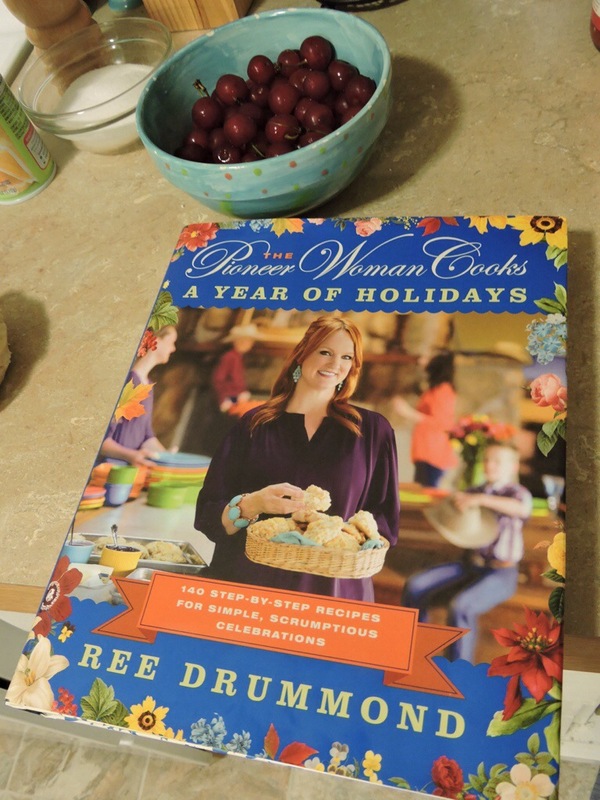 I have a favorite pie crust recipe from a cook book I absolutely recommend having in your library! 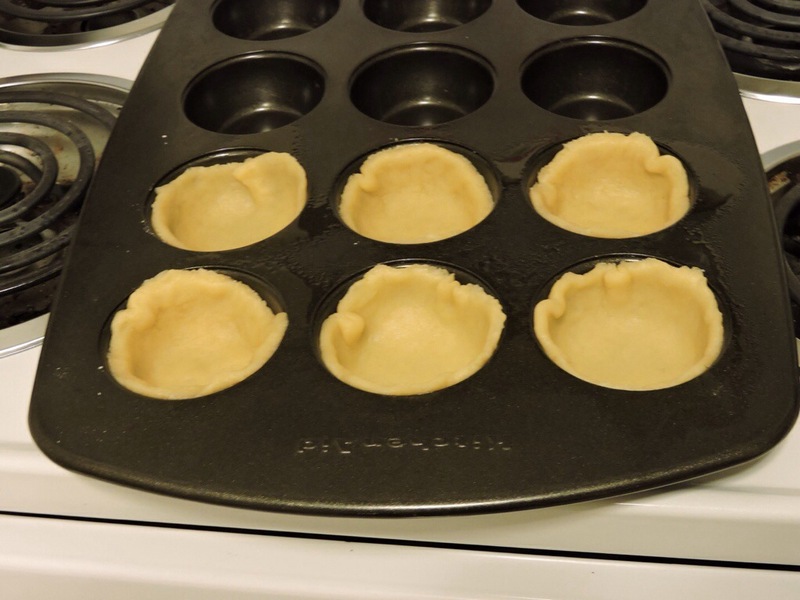 I used the pie crust recipe from the holiday cookbook from The Pioneer Woman, but feel free to use your favorite pie crust recipe or a premade one. 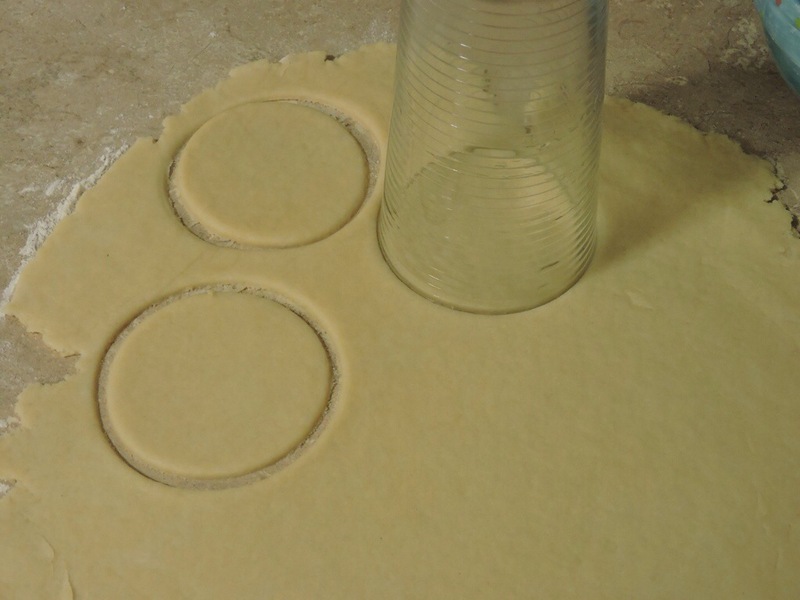 If making your own crust, roll out dough on a lightly floured surface. 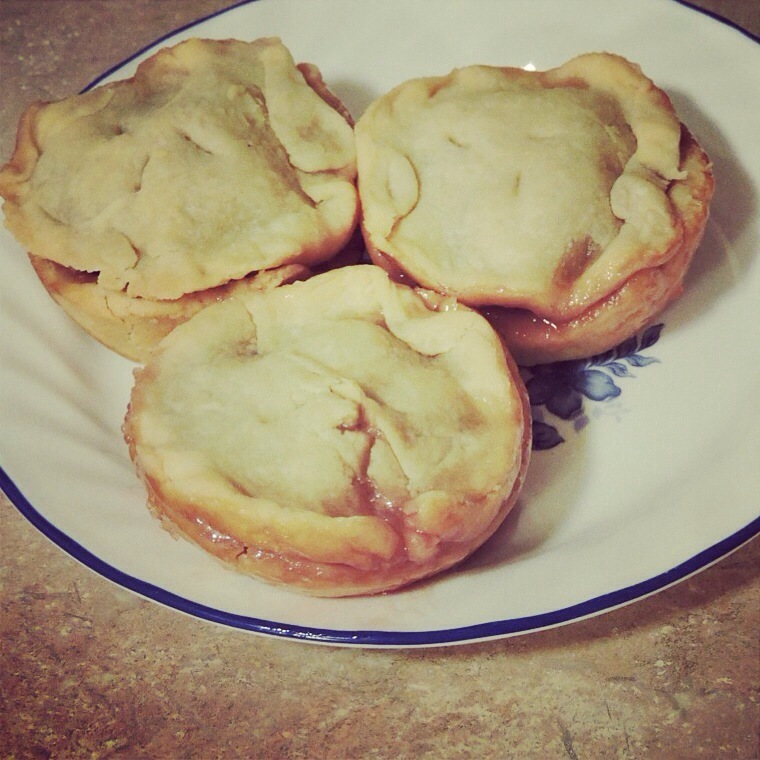 My home made pie crust made 6 of each with a little left over. 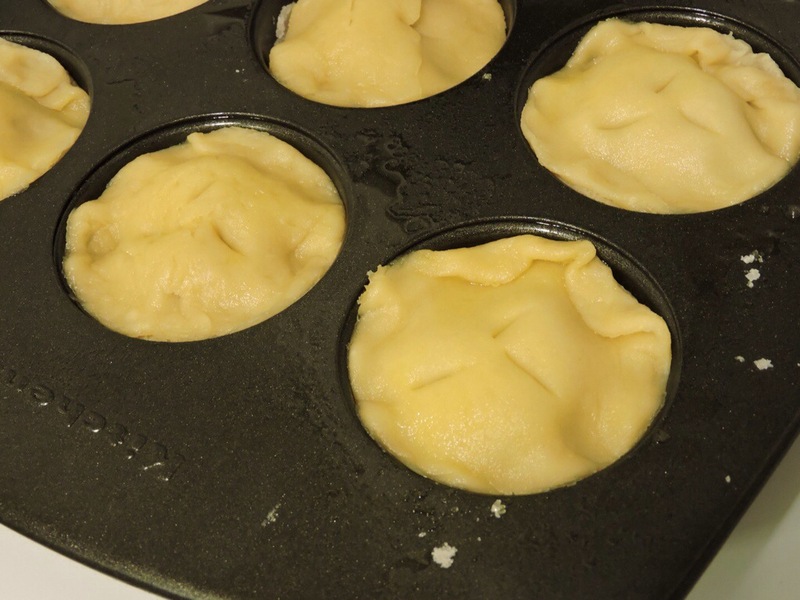 Tuck the larger circles into your greased muffin tin. 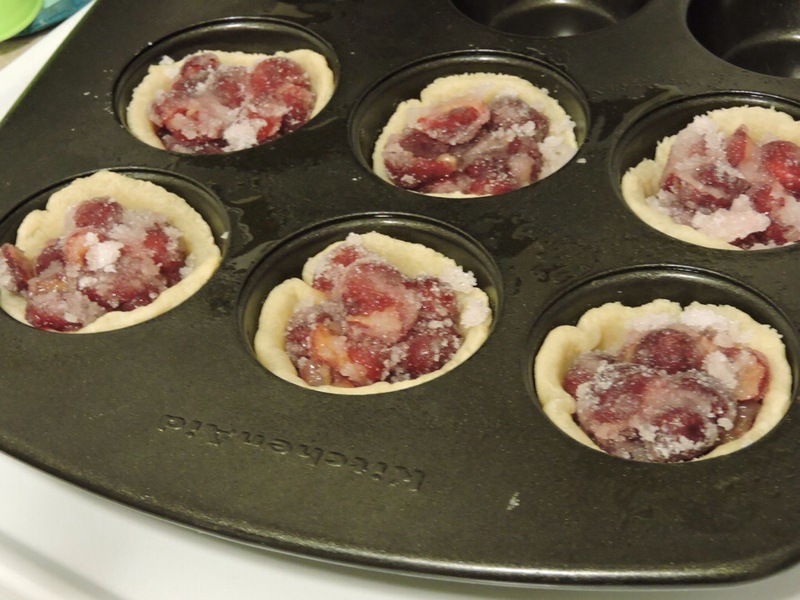 Bake for 3-5 minutes until the crust barely starts to firm and set. Seed cherries by halving them and prying out the pit. 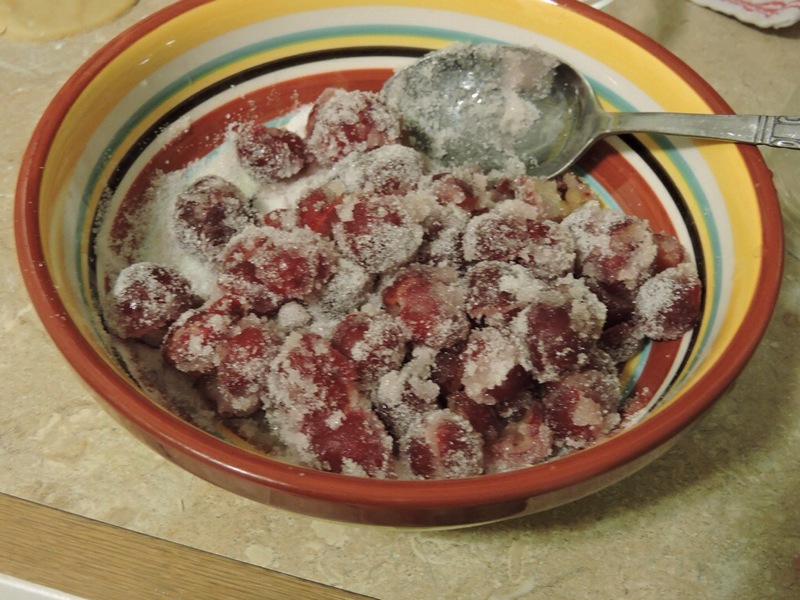 Coat cherries in half of the sugar, toss, then mix in the rest of the sugar to coat again. Reduce the oven heat to 325. 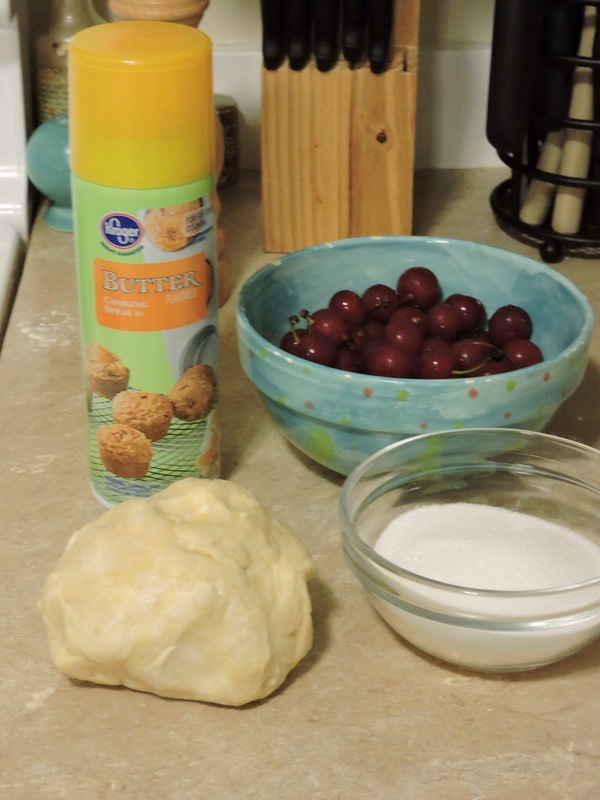 Spoon cherries into crusts. Press down to fit the maximum amount of fruit. 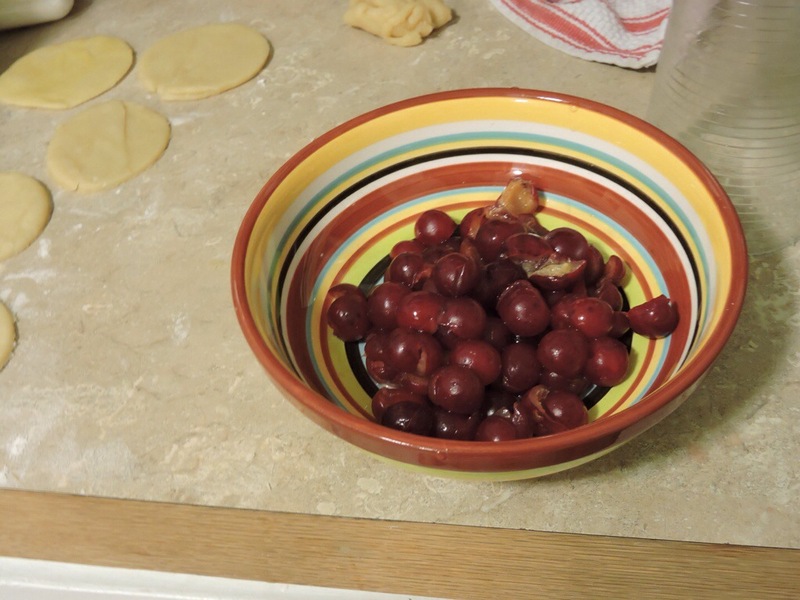 My cherries are specifically pie cherries, so they’re a little more tart. 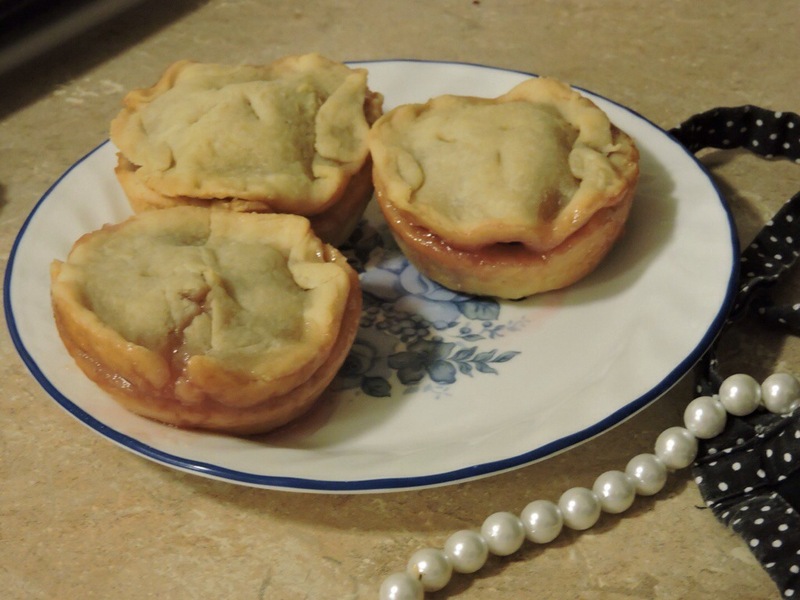 To compensate, I sprinkled the leftover sugar over each pie, but this is optional. 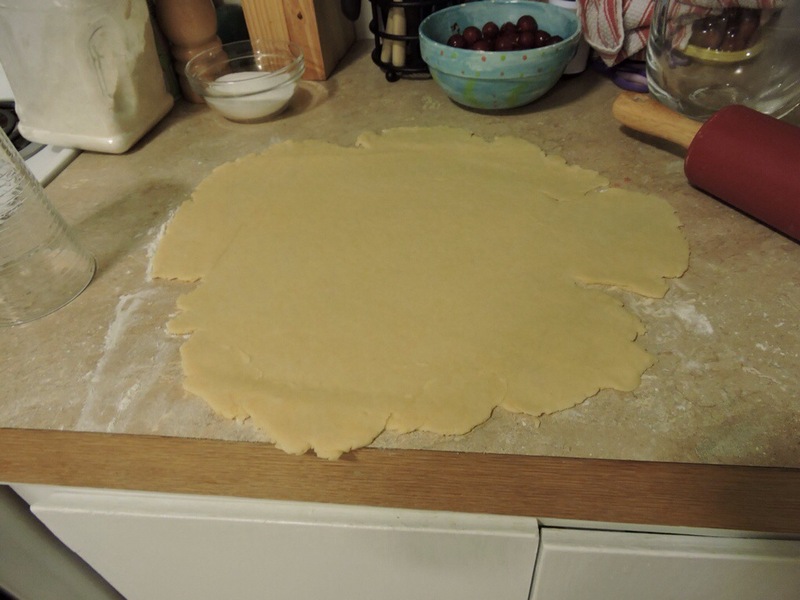 Next I put a small amount of butter over each of the smaller crusts, but again, optional. 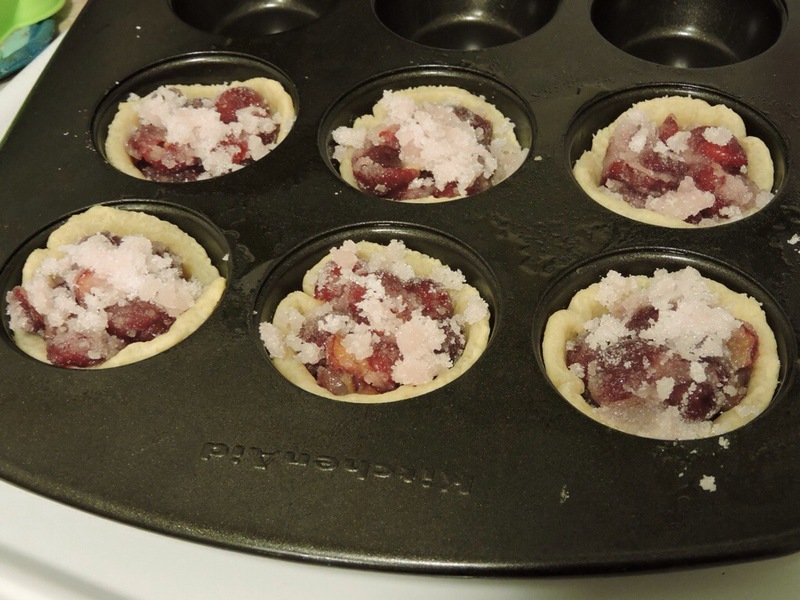 Fit each smaller crust over the mini pies by pinching or pressing down into the tin. Note in the above picture I also took a butter knife and made three small slits at the top of each pie. Bake for 25-30 minutes until the sides begin to golden. Let cool for a few minutes before removing from the tin. 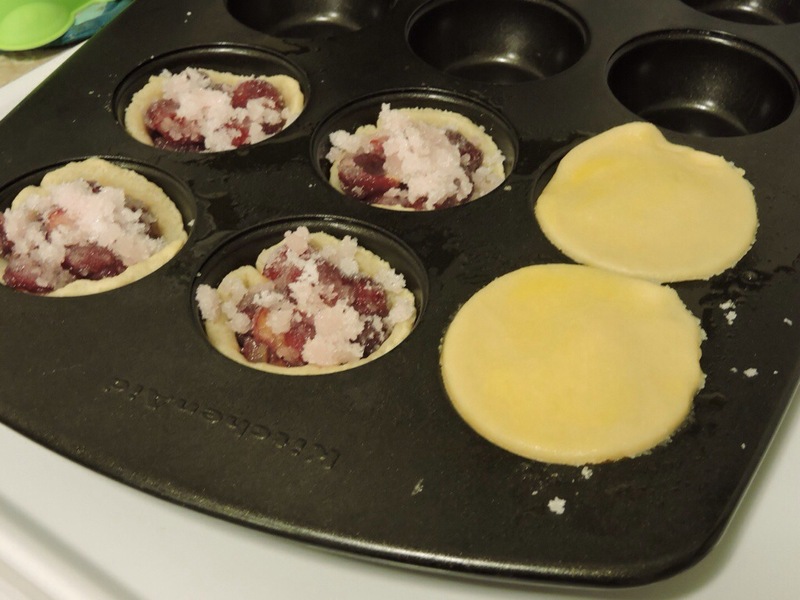 To remove them, I took a butter knife around the edges of the pie, slightly lifted from the side, then used a spoon to carefully scoop them out. On a mild Friday, after cooking nothing but ho-hum dishes for a week, I decided I wanted to splurge. Something I’d been craving for a while was chowder. 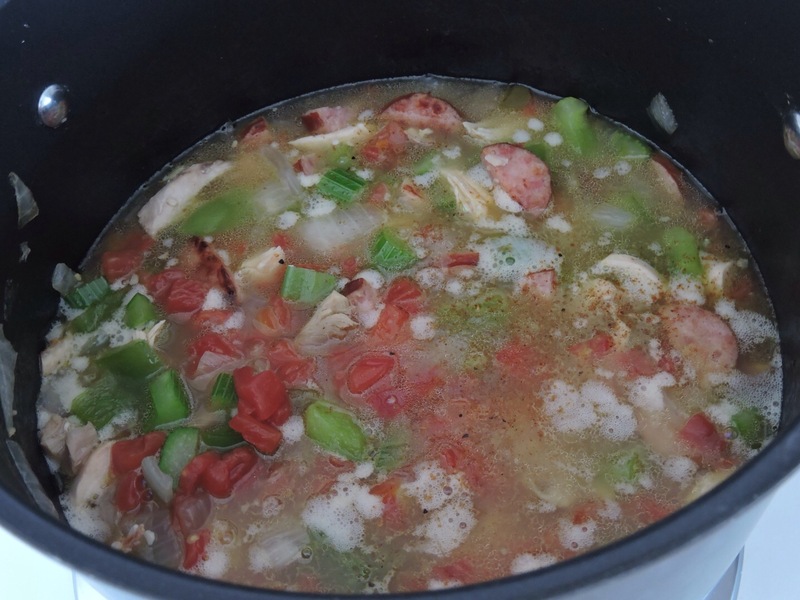 I wanted something easy, the usual seafood chowder recipes I see have a ridiculous amount of ingredients and requirements, but I didn’t want just plain clam chowder either. So I tweaked a recipe and came up with an easier version. Wash and chop veggies. I chose to leave my potato skins on. 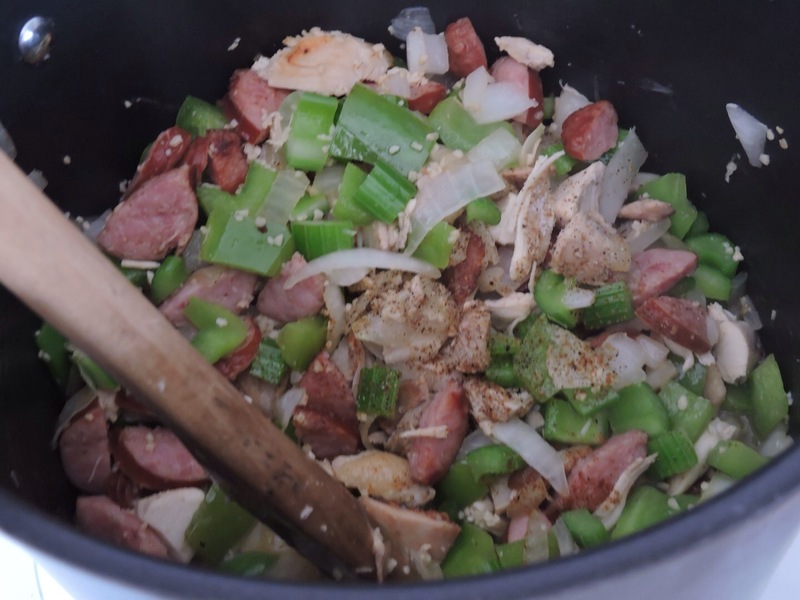 In a deep skillet, add veggies and juice from the clams. Cover with water and cook on medium to medium high heat. 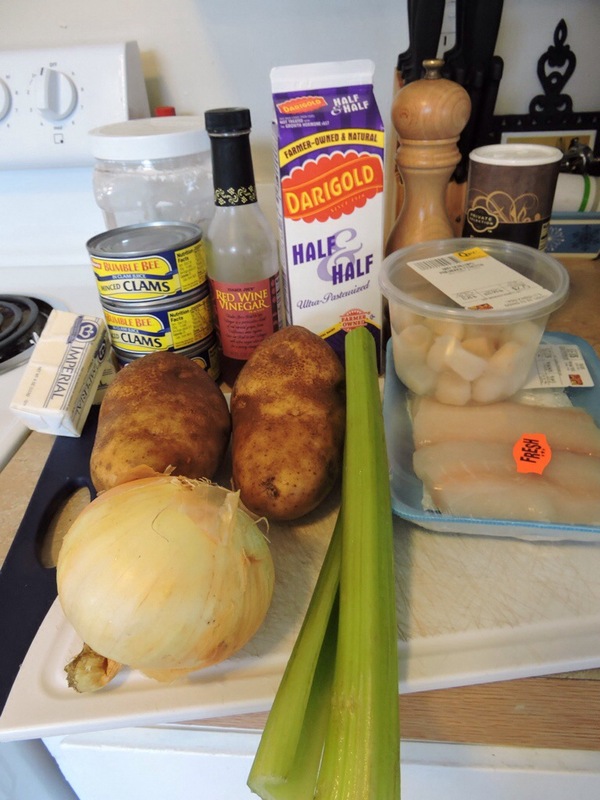 As veggies just begin to get tender, add the chunks of halibut. Continue to cook on medium to medium high heat until veggies and halibut are tender. 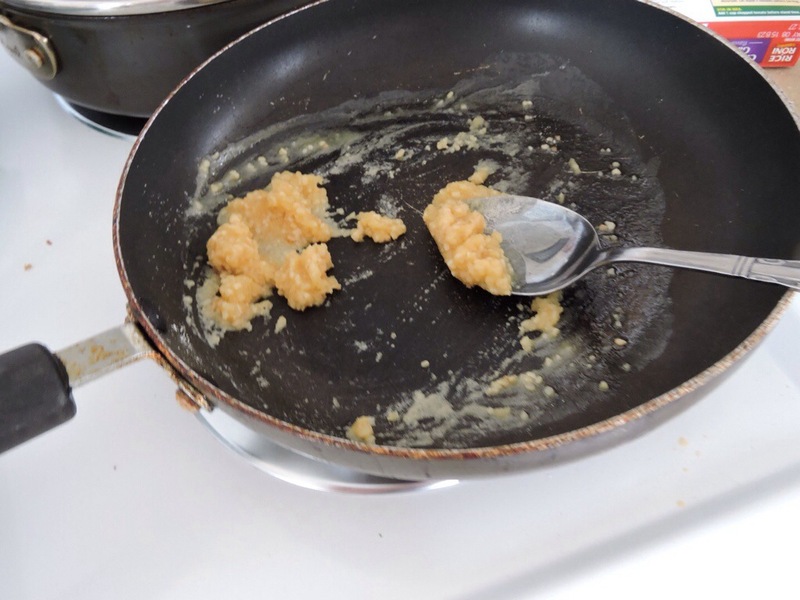 As the skillet portion cooks, melt butter over medium heat in a large heavy saucepan. Whisk in flour. 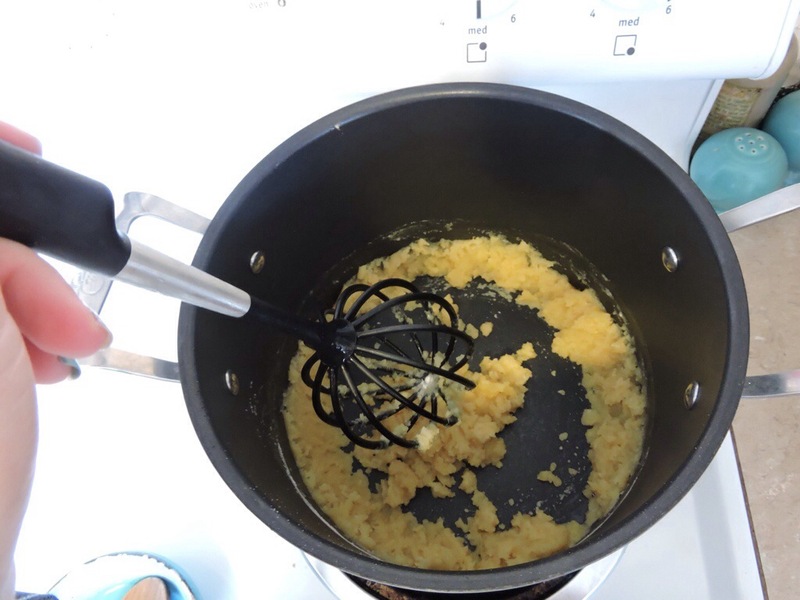 Add half-and-half slowly, whisking constantly until thick and smooth. 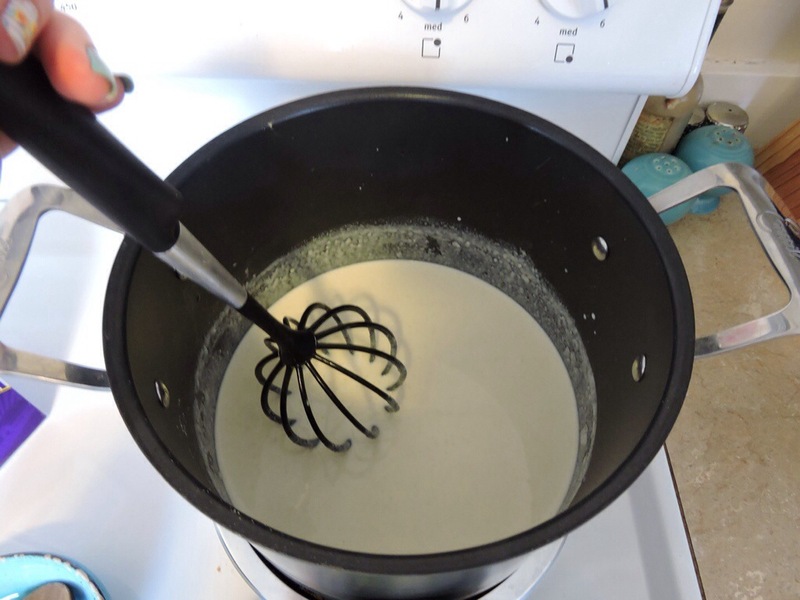 Add the contents of the skillet to the cream mixture. 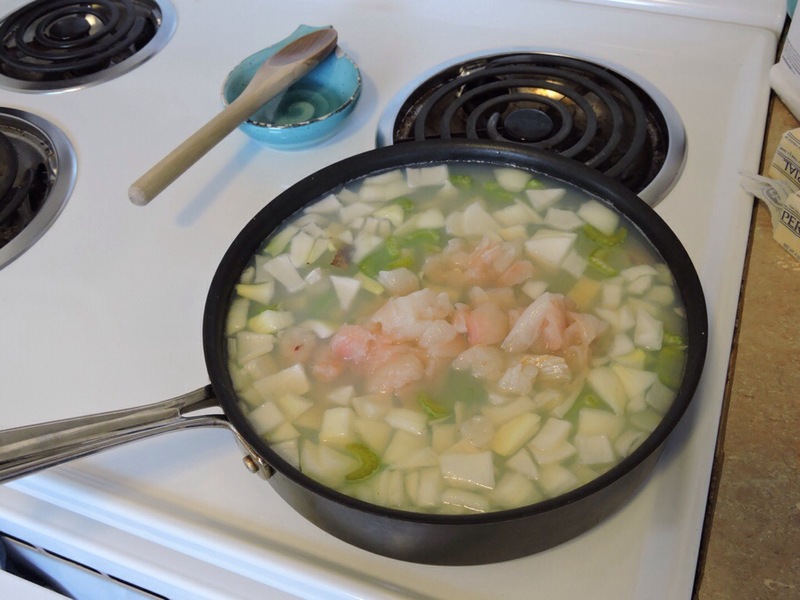 Reduce heat slightly to heat the chowder thoroughly without boiling. Add bay scallops. 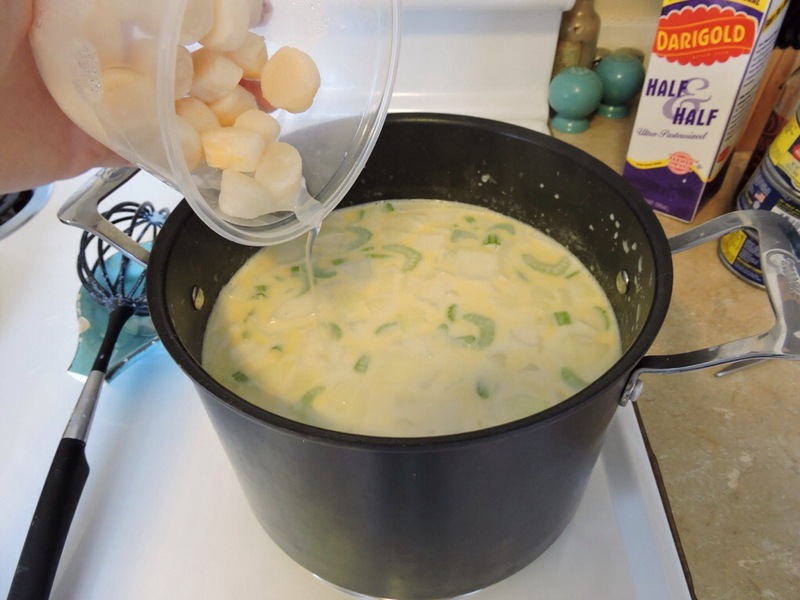 Continue to heat over medium low heat for 20 minutes, until chowder is heated through and bay scallops are cooked but tender. 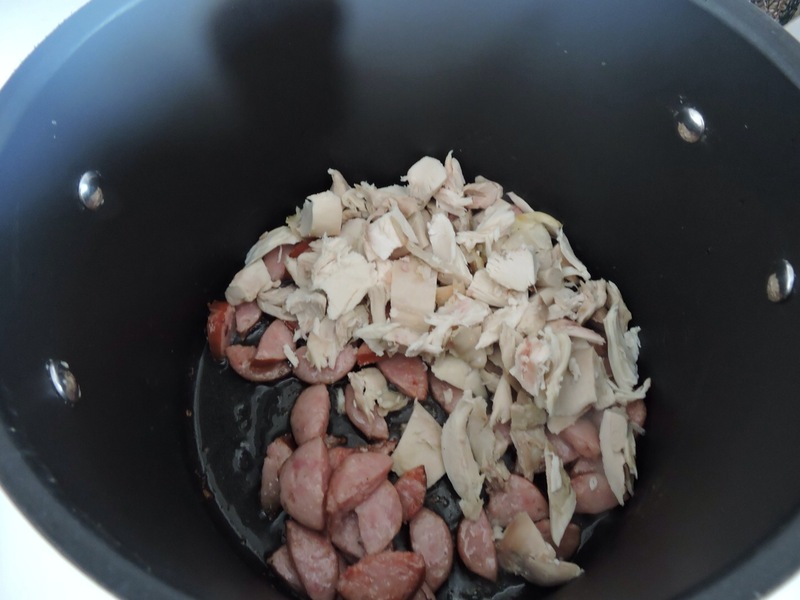 In the last minute or so before serving, stir in clams, vinegar, salt and pepper. I served this up with a nice asiago cheese loaf from our local grocery store. If my husband would have given me the chance to take a picture of his pretty bowl of chowder before starting to wolf it down, you would get a better picture of the finished product. Instead, you’ll have to settle with my to-go container at work. Have fun cooking y’all! So I have about 5 posts in “draft” because I’m too lazy, don’t have enough detail, blablabla.. I have now created something that has pushed all of those things aside and made me want to post this asap! As you can see from my enchilada rice post, I love enchiladas! Mexican food in general, but I could eat an enchilada combo meal of one chicken one cheese every day of my life and be happy. Fat, but happy. Well I made enchilada rice this week, and of course the giant can of sauce was on sale. Since I only used about 4 tablespoons out of it, I had a lot left and didn’t want it to go to waste. 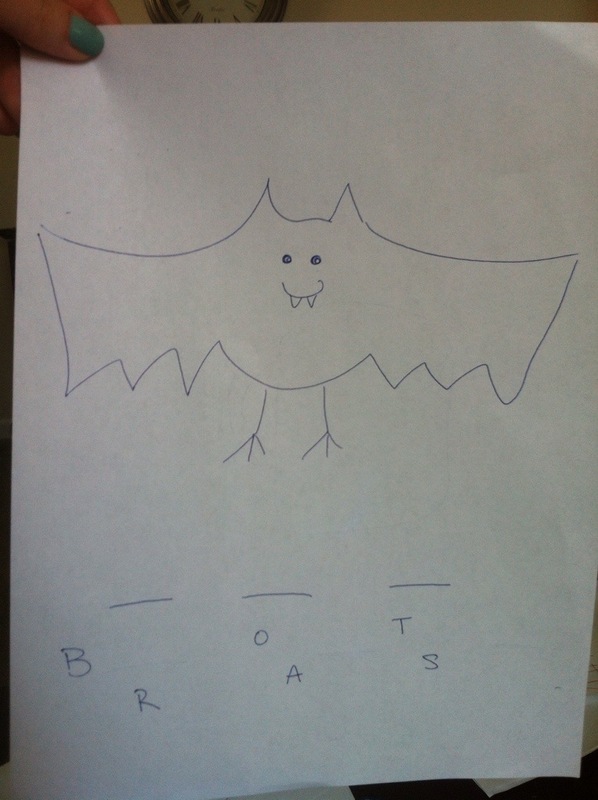 I decided to get creative – for this reason I really didn’t take any pictures. I didn’t know how it would turn out. I’m kicking myself. Mmmmmm. There’s not a lot of detail in that picture and for that I’m sorry. But its simple and DELICIOUS. 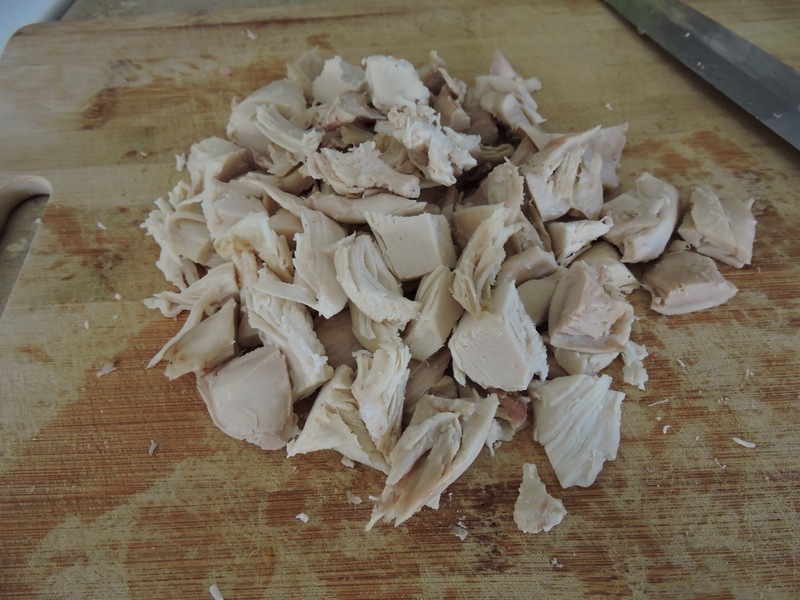 Cut chicken into one inch pieces and season. I used salt, pepper, cajun seasoning and garlic powder. Cook on a medium heat thoroughly. 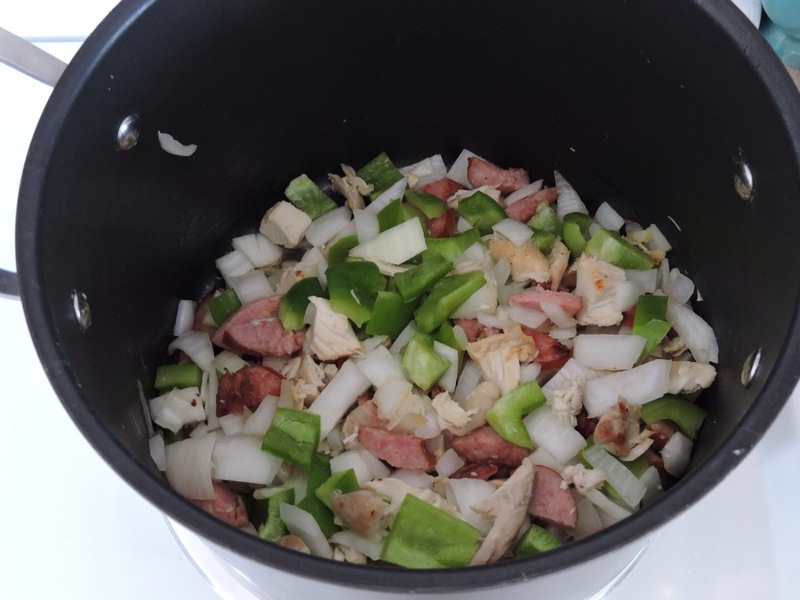 Add chopped veggies to chicken when chicken is halfway through its cooking process. 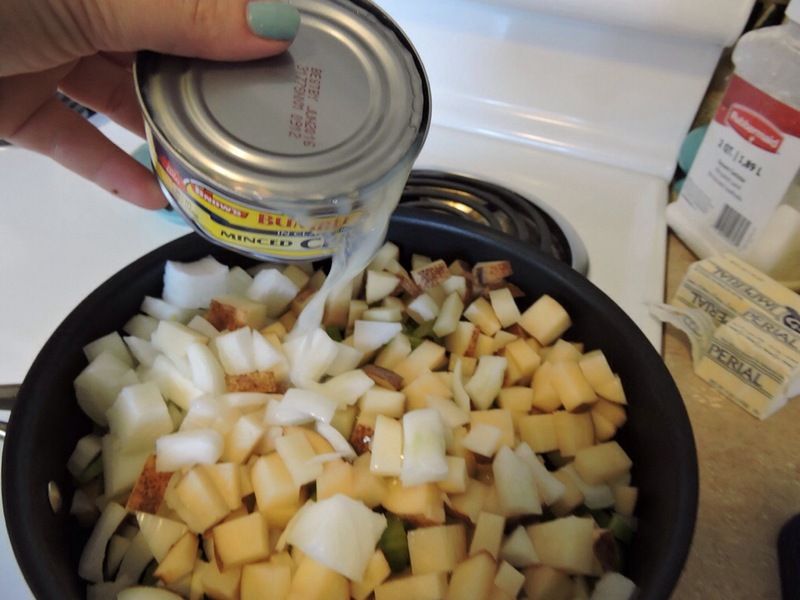 Add more seasoning for the added ingredients if desired. Stir occasionally until veggies are tender. 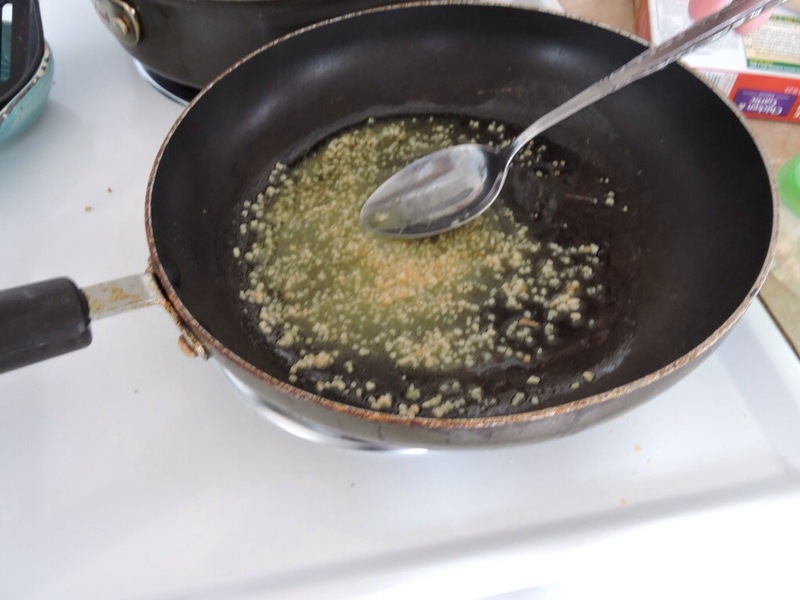 Heat oil in pan for frying. 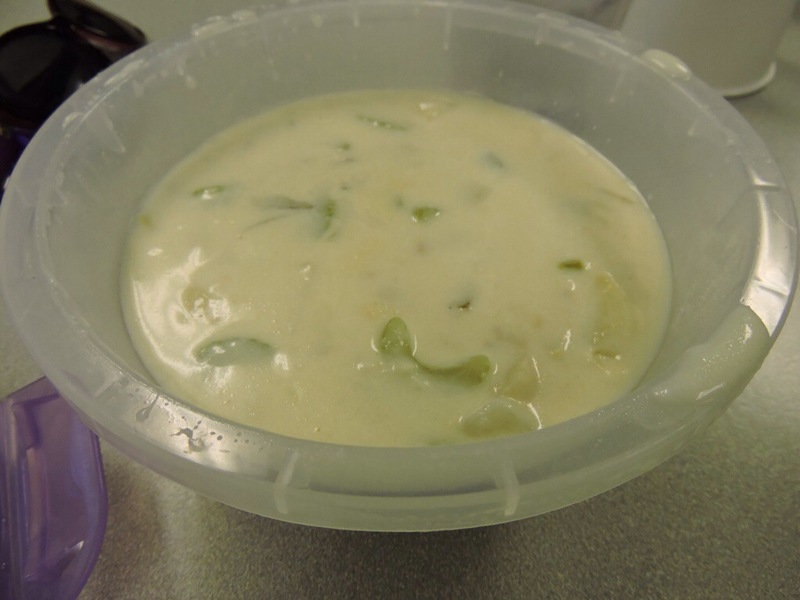 Place chicken and veggies in a bowl and toss with enchilada sauce and half of the shredded cheese. Place 2-3 spoonfuls in the center of the tortilla and sprinkle some of the leftover cheese on top. Enough to fill the tortilla, but have it completely closed when folded. 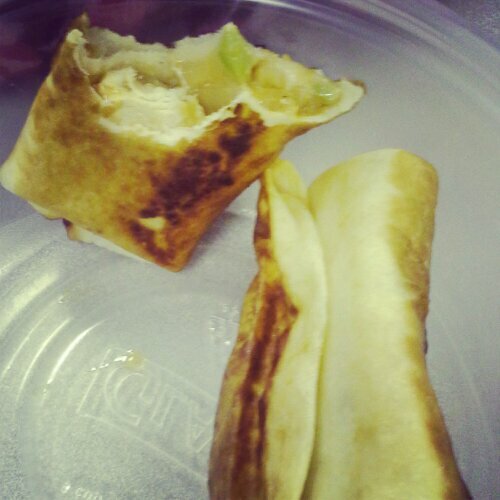 To see crummy pictures on how to fold said tortillas, check out my second Pin Test that inspired this creation! 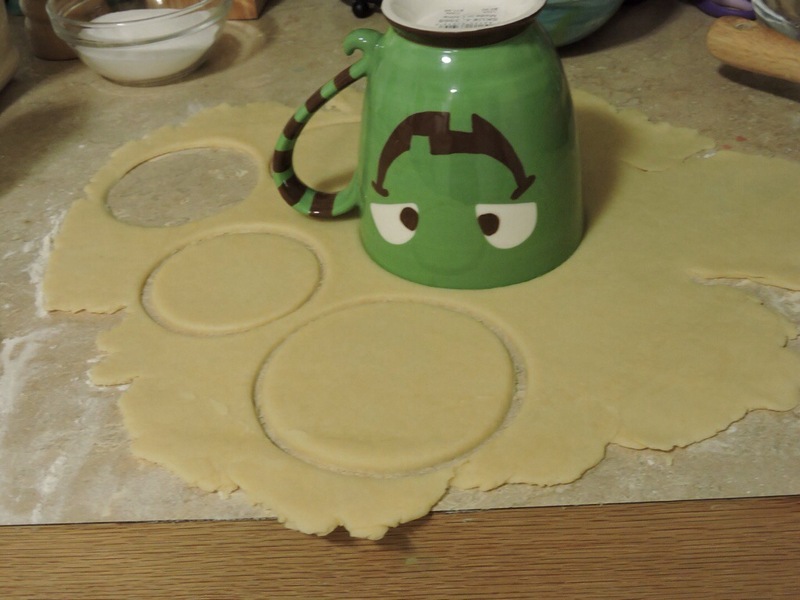 I’ll explain it as best I can: fold each of the shorter ends over the mixture, crease the folds slightly, then fold one longer side over mixture, tuck, and roll. After the chimi is rolled, place it in the frying pan seam side down. Fry until golden brown on each side, turning only once using two forks. 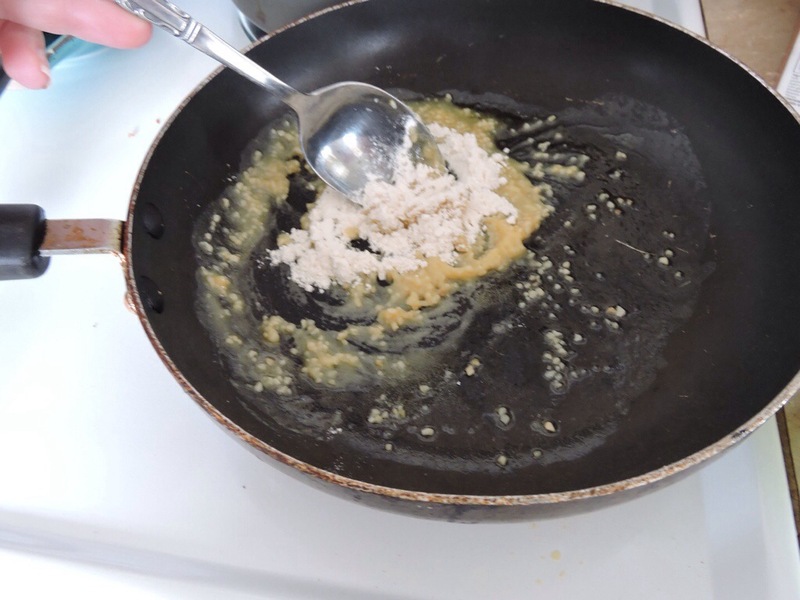 When finished frying, drain on a plate lined with paper towels. Y’all, again – I am so sorry for not taking pictures. 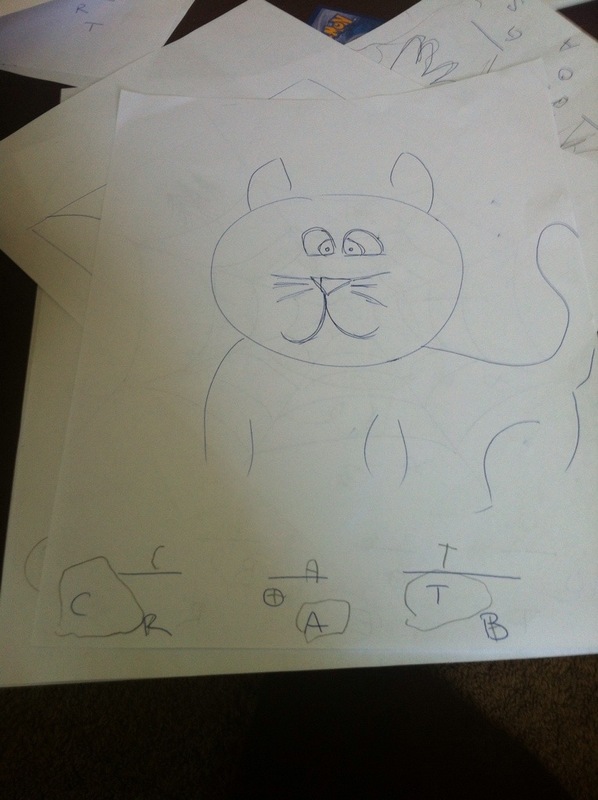 This was an experiment that I wasn’t even sure would work, and then BOOM! It was too good not to post. So I reluctantly put it down to take at least one picture before I demolished it. I encourage everyone to give it a try! In my combing of Pinterest, Facebook and the like, I have found many blogs and posts that remind me of how I want to be a mother. They remind me to let her be silly. To let her be herself. To support her and show her she’s loved.. The problem is, I do that anyway. I cannot imagine a life without my daughter, and I hope I never have to. As much as reminders are always welcome to keep me on track, it’s the lesser of pressing matters to me. Instead, I would rather talk about the elephant in the room. The frustrations of being a mom, and how I feel when they happen. I can’t express the magnitude of love you have when you’re a mom. I would move mountains for this girl, and stick up for her at all costs. At the same time… Sweet Moses she has a list of my buttons and KNOWS how and when to push them. 1) Why is everything that breaks, mine? No. Really. In the 3.5 years of her existence, there has not been ONE THING of my husbands that has been destroyed. Jewelry, clothes, nicknacks…. All mine. It must be contagious too, because my husband just broke my favorite coffee mug. It took a lot to not be mad at him… Bless his heart. 2) What’s with the demands? I can’t say how many times I have to remind my baby girl of manners. It has gotten to the point where I just ignore her. Sounds awful, right? But it just won’t sink in. I can remind her once after a rude “I want milk,” to ask nicely with a “please,” only 5 minutes later to hear “I want Batman.” It doesn’t work! So, instead, she can ask all she wants and I just look at her blankly… Waiting… Until she picks up on it, pauses and smiles with a “please have milk,” or what have you. 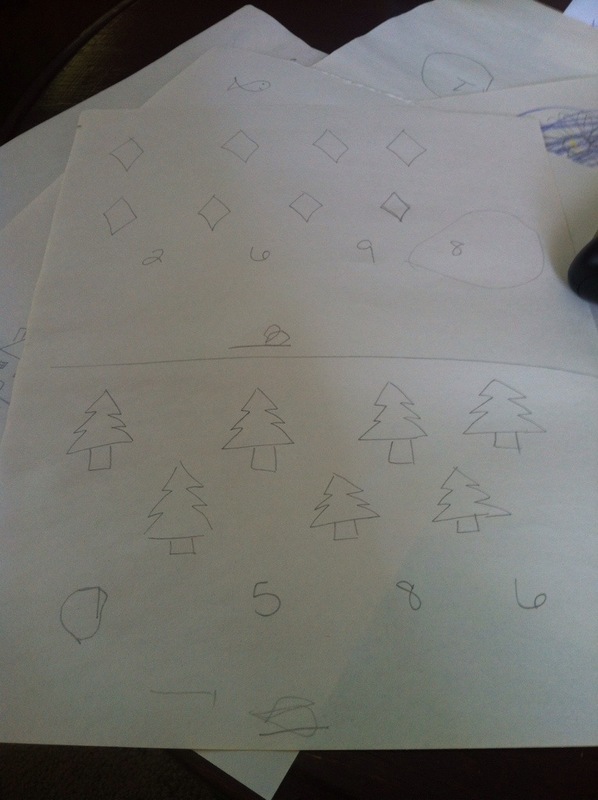 Now, I know she is 3, but I can’t help but feel clueless until I find some tactic that works. It just so happens, that a mild amount of ignoring seems to do the trick, and ends up making us both smile in the end. To my daughter: Do you know how cute you are when you sleep? Sometimes you smile and laugh while you dream and I can’t stop staring at that beautiful face waiting for you to do it again. The last time was after a half asleep trip to the potty to ensure a dry night, to only end up in tears for me waking you up, and those tears turn into an adorable and fruitful laughter of giggles right before the hardest of sleeps. 4) Why does it have to be a tippy? Either way, you could drink the 18 cups of juice and milk you beg of me in a day.. Why through the same princess tippy each time? I actually think you could take down more, faster, if you would just broaden your horizons like I keep asking. I know that you need me. You know that I love you. But sometimes hearing that tone for 10 hours is too much. By the time daddy gets home, don’t be surprised if I tap out. 6) Sometimes mommy and daddy get mad, and it’s not always about you. 7) On that note, I don’t always want to play. I will roll around with you, wrestle, build blocks, read to you, tickle you, cook with you, push your imaginary puppy in a stroller, dance with you, dig with you, slide with you, push you on the swing… Other times you kick, hit, scratch or get this wild look in your eyes that makes me back off. And other times, I just want to sit. Just sit. Watch my show, read a book, or stare at the wall… Just do nothing for anyone but me. Selfishness, I know. But I’m being honest, and I know I’m not the only one out there. It’s not all day every day, I’m just exhausted at some points and need some time. I’ll respect you the same way later, I promise. 8) I’m going to get it out of you..
9) steel yourself… There’s more to life than chicken nuggets. What a concept, huh? Meal diversity from mac and cheese and deep fried chicken could really help this healthier life style that I would love to give you. Of course, the apple doesn’t fall far from the tree here… Hello Pot, meet Kettle.. At least you like broccoli. You didn’t get that from me. 10) Your father compares us to oil and water, but we know he’s wrong. Some of the best relationships in life test you. Nothing is great unless you put in the hours. We’re just getting ours out of the way. Sure we battle each other, have mental stand offs to see who will back down from the spot on the couch. No matter what it ends in kisses or tickles inevitably, and we’re just testing each other. I know you’re 3, you know I’m a grown up. Your dad knows we were meant for each other, and so do I. At the end of the day, our love is what matters, and I think we’re more like salt and pepper. I’m sure I can think of more. I may even post more later. But I’ve had these conversations with other mothers who feel guilty for feeling this way. That your kids frustrate you to the point of doubting yourself and it makes you snap sometimes. I think it just takes practice. Your kid takes their cues from you. If you model yourself for them and they will start to follow. All I’ve seen lately is reminders of how to be a good mom. I’m already a good mom. I love, protect, and provide for my daughter. I give her life experiences and laughter, I feed her, clothe her and teach her. But I’m human. I get frustrated, not follow my own parental guidelines and get caught up in myself. And then I blame myself. I know I shouldn’t, but I’m only human.